The Ventura was a fiberglass rebody of a Volkswagen from Brazil --- similar in concept, spirit, and styling to the awesome Puma. I don't think I've ever seen another for sale, but this one is offered from an estate/garage sale. 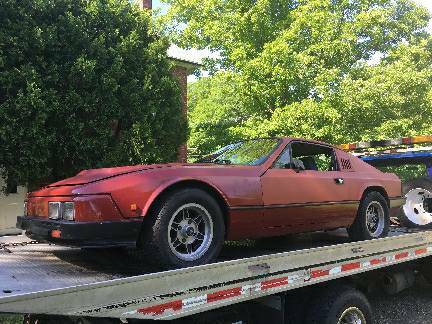 Find this 1984 Ventura Coupe offered for an undisclosed amount of cash, located in Western Massachusetts via craigslist. Tip from Anthony. The occasional Puma appears on a craigslist in the USA, but this is the first Ventura that I've seen and info on these things is limited with the best info coming from a site that was last updated in 2007. Apparently the Puma used a Beetle style engine with cooling fan, but the Ventura used a pancake setup like a Type 3 under an access panel in the hatchback area. these Ventura coupes were made by a small company named L'Automobile. it sold in way less quantities than the Puma, so it's rather important to make sure this car has all internal and external trims - otherwise, some fabrication will likely be required. Hmm. Volkswagen, OK. To me though it looks like a Fox body Mustang with some sorta weird body kit.